In the leafy backyard of his Elizabeth home, Gerry Mack sits comfortably ensconced in a deck chair, chatting with a visitor. Six feet away, the girls of his backyard brood go about their business, producing food in their unobtrusive way. But there's no gentle clucking or brash scratching of leaves and dirt. Instead, a silent stream of golden specks flashes in and out of the summer sunlight, rising in haste toward the treetops where invisible cicadas chant their summer chorus. Mack's golden girls are not part of a flock, but of a colony, or as you and I think of them, a hive. That stream emanates from a stack of neat white boxes set upon a wooden stand, where tens of thousands of bees spend their days building combs and filling them with honey. 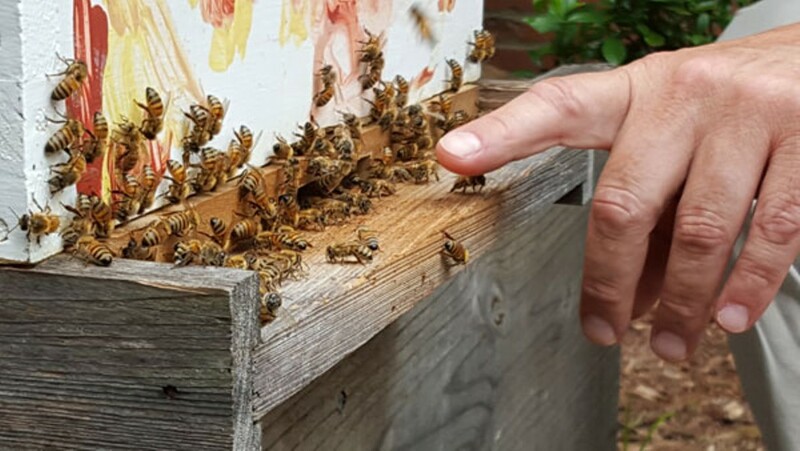 As president of the Mecklenburg County Beekeepers' Association, Mack estimates that his is one of thousands of hives tucked away in backyards across the city, and he expects that number to grow. Across the country, the explosion of the local food movement has led urban and suburban residents to root up pointless patches of lawn to put in garden plots and raised beds. Along the way, chickens have become backyard darlings, inspiring popular websites like BackyardChickens.com and MyPetChicken.com. But chickens are so, like, 2012. These days the true locavore is getting into bees, and we Charlotteans are no exception. When Mack and his wife Libby first attended the Association's "bee school" about 12 years ago, they joined about a dozen other people. "It was an interesting class," Mack says. "A bunch of good ol' boys sitting around talking about cows and sheep and pigs and occasionally bees. It was very farm oriented." Since then, as the pair has become more involved, they've watched classes grow to over 140 students. According to Mack, there is no easy way to categorize the eager new beekeepers. "If there's a cross section of people, we've got them in the organization," he says. Yet he consistently hears two particular reasons those beginners want their own hives. Many seek to revive a hobby they remember watching their grandparents practice. Others have heard about the rise of colony collapse disorder (CCD), a mysterious ailment killing entire hives across the nation, and the resulting threat to our food supply. Around the country, crops as diverse as broccoli and blueberries owe a large portion of their fertility to honeybees. In 1999, several years before CCD became big news, a University of Cornell study credited honeybees with a $14.6 billion share of American agriculture. And that's not even counting all that delicious honey we consume with our biscuits and fried chicken — 450 million pounds of it in 2013 worth over $300 million, according to the National Honey Board. Scientists have only begun to tease apart the potential causes behind CCD, which reached alarming levels in 2005. A recent scapegoat is a group of pesticides called neonicitinoids, which impregnate everything from the flowers at your local nursery to millions of acres of corn in the heartland. Yet most studies suggest multiple causes, leaving bee populations — and our dependent crops — still vulnerable. Enter our local army of home-based beekeepers working to boost colony numbers. Says Mack, "I think more people are realizing that it doesn't take an enormous government program to help the pollinators." Bees departing from his simple hive can travel several miles in search of pollen, nectar and resins needed to keep the hive functioning and build stores of honey. "These girls will go through the whole neighborhood and take care of everybody's stuff," he says, explaining the communal benefit radiating from one backyard. "We've got neighbors that vegetable garden, and when we first started they reported better crops." Though many might fear a swarm of buzzing, stinging pests, the Macks have been proactive in communicating with their neighbors and introducing local children to the hives. Catching them young seems like a good strategy. "The funny thing is, when you get down to the kids' level, they say 'Oh yeah, I learned about that in school,' and they start rattling off all these bee facts that their parents never knew," he says with a grin. Bees in an urban area enjoy one advantage their country cousin bees may envy: a diverse local food scene. "Here in the city we're blessed with having a wide variety of things for bees to eat," Mack says, contrasting that with an apple orchard where resident pollinators may enjoy only a week or two of their primary food source before having to move on. In his heavily-treed neighborhood, Mack sees bees emerge as soon as late January to feed from the inconspicuous blossoms of red maples. Our generous stretches of warm weather mean extra production time, with the tiny foragers moving on to hollies, tulip poplars and the ubiquitous crape myrtles. In a typical year a hive can be harvested two or three times between March and August, yielding anywhere from 50 to 150 pounds of honey each time. Still, for many city dwellers, the idea of a simple hive tucked discreetly in the back of a quarter-acre lot is just a dream. What if your "yard" is a parking lot, or you find yourself several stories up a high-rise building in the heart of downtown? Simple: look up. That was the answer for chef Clark Barlowe when he opened Heirloom restaurant in early 2014 in the Coulwood neighborhood. Like many of Mack's students, Barlowe retains childhood memories of his grandfather's beehives. "I never took an interest in beekeeping myself until about 7 or 8 years ago," says the energetic chef. "That was the point at which I started keeping my own hives," setting them up on family property in Caldwell County. About two months before his Charlotte restaurant opened, Barlowe's brother and parents helped move three of those hives onto the roof, where alert diners gazing up from the parking lot may spot the bees' tiny silhouettes against the sky. Thanks to healthy swarms this spring, the chef has added three more colonies to his rooftop apiary. Even as a busy restaurant owner and local-food advocate, Barlowe easily fits beekeeping into his schedule. "I try to check on mine once a week," he says, saying it can take as little as five minutes to find the queen and check that the bees are successfully collecting nectar and pollen. Even without lifting a lid, he says, "I can walk by the front of the restaurant and tell you which hive is the healthiest," simply by the activity at the bees' front door. Of course, the chef puts all that hyper-local harvest to good use, starting with cheese pairings that may include a picturesque chunk of raw comb oozing with golden goodness. "We try to leave it as natural as we can," Barlowe says. "I really just want to let the honey speak for itself." He also uses the beeswax in the kitchen, cooking potatoes in it before removing the skins and creating a purée that carries a delicate honey flavor. Heirloom is not the only restaurant in Charlotte sourcing honey from its rooftop. Above the luxurious rooms of the Ritz Carlton hotel, two hives command an impressive view of the downtown skyscrapers. Along with several planters growing herbs, peppers, tomatoes and more, this garden serves as a micro-model of sustainable urban farming. A short elevator ride below, standing behind the bar of the Punch Room, cocktail maestro Bob Peters describes his delight at learning his new workplace came complete with beehives managed by Cloister Honey. "That was just the icing on the cake," he says. "I was like, let's go check it out... are they up there right now, can we go?" Both he and chef Matt Carnevale speak passionately about the integrity of local sustainable ingredients, and are eager to learn the basics of beekeeping. In fact, Peters helped Barlowe during his recent honey harvest, as a way to get a first taste of the work. At the Punch Room, Peters and Carnevale creatively incorporate their 70-pound share of the bees' annual production into their offerings. Guests can look forward to an upcoming cocktail featuring a honey-aleppo chile syrup with blueberries and bourbon, as well as a steak tartare dish featuring honey-inflected ricottas and honey-pickled blueberries. Peters dreams of a day when he can legally serve mead. "That would be really cool to say, 'I made this alcoholic drink that I made from bees on the roof that I tended all year.'" For all these local bee enthusiasts, their hives bring them multiple pleasures. Whether providing hyper-local ingredients, protecting the integrity of our food supply, or simply offering a meditative way to reconnect with nature, "the girls" have become an essential part of their lives. Gerry Mack sums it up best: "I've got my own little bit of agriculture here in the backyard. It's unobtrusive, it's quiet. It's such a calming experience." Kind of like chickens, but a little bit sweeter. The essential hive is housed in at least one deep brood box supplied with 8 to 10 frames upon which the bees build honeycomb. This is where the queen will reside, new bees will hatch and pupate, and winter honey reserves will be stored. A queen excluder screen between this and the smaller "supers" above make sure that all the important parts of the hive stay below the section harvested for honey. It is generally advised to start with at least two hives to allow for mutual support through shared resources. Materials & Costs Additional tools may include a smoker to calm the bees, the famous veiled hat and suit (though both Mack and Barlowe work their hives without the full suit), and a hooked pry tool to separate the boxes. Depending on how much a beekeeper builds from scratch, a new hive setup can cost up to $500. However, once the initial investment is made, a beehive can last a lifetime with minimal additional investment each year. Extraction equipment is costly, but can also be rented. During the summer, the bees need little support, as long as they have access to plenty of flowers and fresh water. On the other hand, harvesting can take several hours and be physically demanding, as a full super weighs 50 lbs. In addition, late summer and early spring are important times for the beekeeper to assess the hive for disease, pests and sufficient honey and population. Aside from those few labor-intensive periods, Mack says, "You spend more time taking care of your dog." The Mecklenburg County Beekeepers' Association offers its annual "Bee School" in January. Two-hour weekly meetings run for about two months. Students learn everything from how bees work to extracting honey. They also will be provided with a mentor for individual assistance with their own hives, and a one-year membership giving them access to some extraction equipment. Visit www.meckbees.org for more information. For those wanting a briefer introduction (and a full belly), chef Barlowe offers a hive introduction workshop on Wednesday afternoons at Heirloom restaurant. "We hop up on the roof, we look at the hives, 45 minutes to an hour, then we cook them a 3-course meal." Call (704) 595-7710 for more details and to reserve space. *The North Carolina State Beekeepers Association offers opportunities for hive owners wanting to delve even deeper. They offer webinars, an annual conference and a Master Beekeeper certification program. Find them at www.ncbeekeepers.org.